We walked in to Russell’s store to get a spare tube for one of the back tire’s on Husband’s bike. The one he chose to ride has two different size tires and two odd sized tires at that. Fortunately Wally World did not have them which made us go looking for bike stores. When Russell was helping us Husband asked him where was a good place in town to eat. Russell told us of quite a few good places. But said he goes to ‘the diner’ every day. 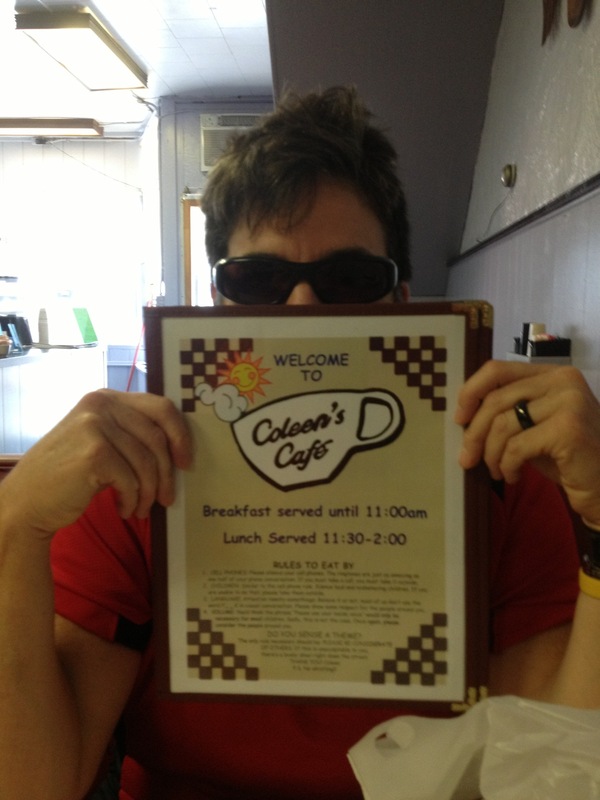 So we went to the diner. How appropriate. In the diner we had fabulous food served by someone who knows how to run a diner. I had Husband send a picture of the menu rules to my daughters. They probably thought I wrote down the rules for the diner! I did have a difficult time not whistling though. But I’m a rule follower. For the most part…. 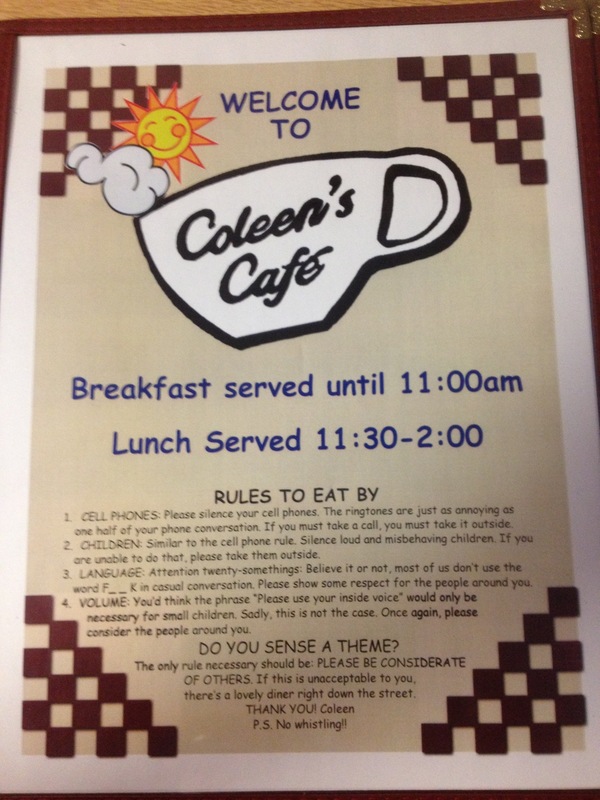 She told us her mom didn’t know how to spell “Colleen” which is why her name is spelled “Coleen”. I found that quite endearing of her mom. While eating there were two fella’s who came in and sat at the counter. They said hello to ‘Coleen’ and each other. 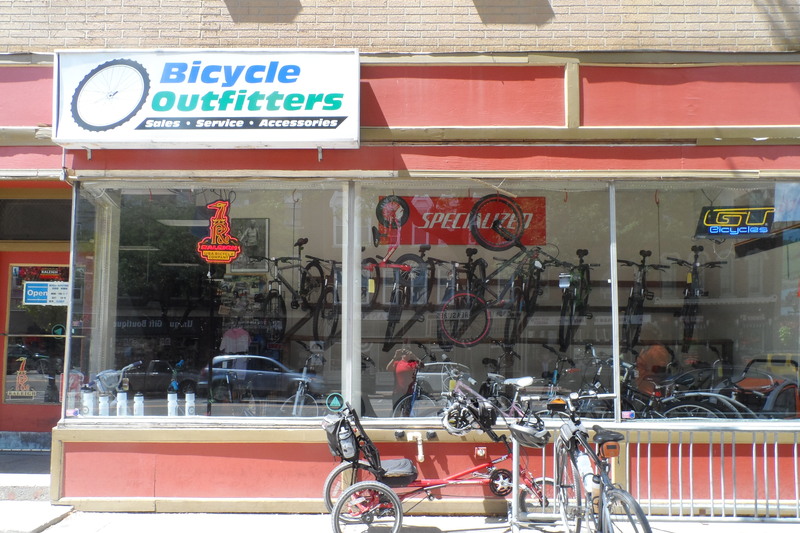 And when Russell of the bike shop came in they all said hi to him. And very happy to be in this environment. Russell chatted with us patiently while Coleen finished other people’s meals. Then asked for a cup of soup to go. When he left he said goodbye and hopes to see us again. The other fella’s at the counter and Coleen asked if we had seen his dog at the store. A yellow lab. No, we didn’t. They had a short discussion thinking the dog, named Sprocket and called Sprocko, must have been in the back. Russell sometimes has Sprocket watch the store while he comes down to Coleen’s for lunch. Then they had a short discussion on how old Sprocket was. One of the fella’s though he was almost nine. No, no, said Coleen. He was nine last year. He’s almost ten now. I shared my joy with them that they know how old their friend’s dog is. They thought it was funny I said that and we all chuckled. There was something familiar and easy about that chuckle. Then Coleen made Husband some red rasberry and pecan pancakes to go. Because she would be closed when we came back thru. What a wonderful way to live. In a community. Where everyone knows your name. And the age of your dog.